Coming soon – notes on the technique and some of the experiments I made whilst learning how to make prints using the Japanese technique. A whole series of my work has been inspired by a drawing of my father’s from 30 years ago. 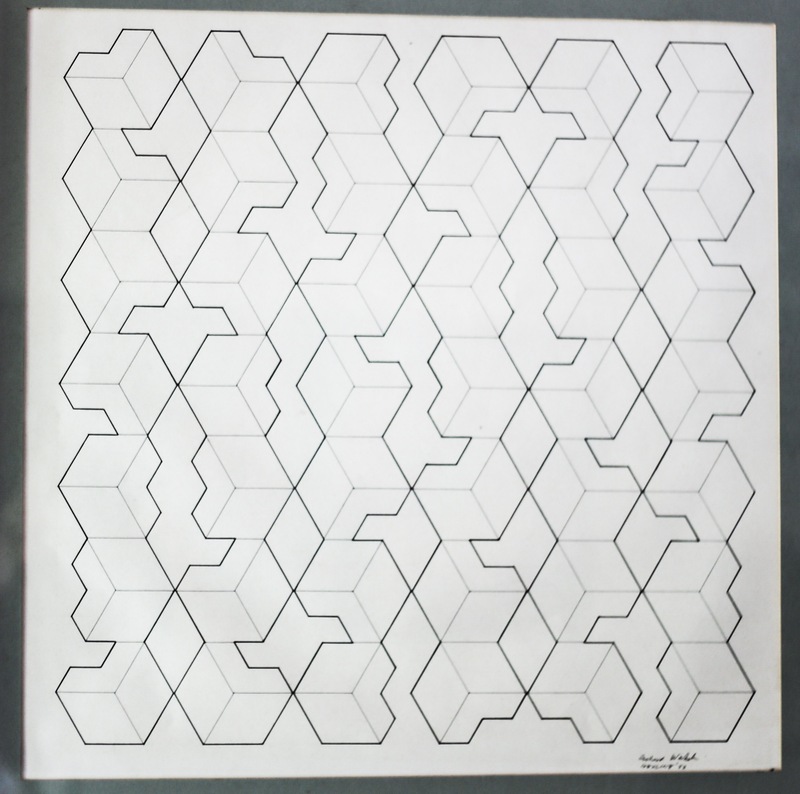 His original was based on visually extracting shapes from a classic Tumbling Blocks schema used in drawing, painting, patchwork and many other formats. This is his drawing on paper in ink and two thicknesses of line. I have made a number of drawn versions of my own. A sketched and cut version in heavy water-colour paper. A sketched drawing in white crayon on water-coloured paper. After many other versions in drawing, painting and cutting I have now embarked on a low relief version in painted plywood. The pieces were cut out usung a tiny reciprocating jig-saw that my mother owned from the mid ’80s. Here are some of the stages I have passed through. Hopefully tomorrow it will be finished. Laying out the pieces and deciding how far away from the surface they should sit. Here’s the plywood block cut with the design, after printing and after washing. I like the way the wood grain shows faintly, as well as a couple of mistakes! I cut the design in plywood and printed several versions of this yesterday. I am going to make a much paler print, then make another cut block with straight cuts which I can then over print in a dark colour. The woodcut block after printing, it now needs to be washed to clear the build up of ink in the incised lines. I made this block back in my studio after the course run by Jonathan Ashworth, at The London Print Studio. I really enjoyed the cutting part, but I have to say I find the print process more challenging. I seem to get ink in all the wrong places. I have not yet made a two colour version of this block. I may cut some more wood away and do some more prints. I have used the block with various colours and right now I love the block itself, I have inked in the places where the wood has been cut away, the other colours are the remains of past imprints. I have still not properly mastered the skill required to make a good print, there are lots of ways of pressing the paper onto the block, probably the best is by using a professional press but they are expensive. There are lots of smaller cheaper presses on the market or available for ad hoc use at various print studios. The options for independent studios is to use a hard rubber roller, a barren, or the back of a spoon. These all require a certain amount of time, the spoon method takes the longest. I have discovered by watching helpful videos on You Tube, that it is possible to lift the paper, One end at a time, to scrutinise the progress of the print, so you can go back over any inadequately pressed areas. These prints below are not in any particular order apart from the first, which I made before cutting lines across some faces of the block. Here I didn’t pay close enough attention to how I was preparing the block and got ink where it shouldn’t have been. Also I failed to adequately press the paper in the lower right corner, hence the missing edge. Here too I failed to press the paper down adequately, Of course once you’ve pulled the paper off the block, it is impossible to place it down again accurately enough to make up for mistakes. I recently attended a woodcut and print workshop at the London Print Studio taught by Jonathan Ashworth. It was a great day, Jonathan is a super teacher – wish it had lasted longer! The woodcutting takes some time and skill and then there’s all the printing to be done. We began by simply making different kinds of marks using the various tools on a small block, just to see what it was like. Then we each made a block to our own design. This is my first block, after I had printed from it several times. The woodcut block after it has been printed from. This is the first print I made whilst at the workshop, a two colour print, the vertical lines are on the back of the same block. I printed the dull pink first from the front of the block and then later the blue using the back of the block. Heres a print I made later at home, just one colour. At first I found it quite difficult to make the print even, it was so easy at the workshop as we used a large professional press. At home I only have a hard rubber or a barren. It takes practice but I have definitely improved. I made this two colour print at home, making a mistake with the registration, so its slightly wrong both horizontally and vertically. So much to learn!